Children must be aged 5 and over to do nippers. 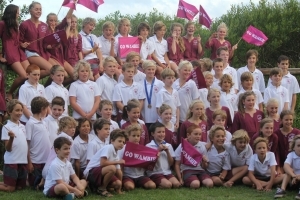 Nippers at Wamberal starts on a Sunday with marshaling at 9:00 am on the beach in front of the clubhouse with children assembling in their age groups. All children are requested to have their attendance recorded by their Age Manager prior to joining the morning’s activities. If you arrive late, and activities have already started, accompany your child to their Age Manager and have their attendance recorded. Please ensure you do this as the Age Manager needs to know how many children are under their care. Children should arrive ready to start activities with their Wamberal skull cap and pink vest on and sun screen applied. Under the instruction of their Age Manager children will then take part in fun on the beach and in the water. Under 6, 7 and 8 age groups are encouraged to do water wades and water relays every week to learn how to negotiate the surf. These age groups also play lots of games in the sand and surf in order to familiarize themselves with the beach. Because of the sometimes rough conditions at Wamberal, these age groups may be taken to the Wamberal lagoon. It is very important that the parents of Nippers who have younger children are supervised at all times when they are at the Lagoon. The Lagoon has very sharp drop offs and it is easy for young children to slip off into very deep water close to the shoreline. On certain days instruction will be given on surf awareness, surf safety and surf skills using the Surf Ed. Program. Children are required to have participated in the Surf Ed Program for their age group before the end of December . Surf Ed. is the only compulsory aspect of Nippers. We recognise that confidence in the surf comes with time. By fostering an encouraging environment each child will challenge themselves at their own rate. Nippers will usually finish by 11 am and is followed by a barbeque. Monies raised from the BBQ support our junior activities. Wamberal SLSC website contains all of the information you need to refer to during the Nippers season. It also has our facebook page which will be used for important or last-minute communications. The website also contains information on registration, proficiencies, key contacts, training events, calendar of events and competition guidelines. The “Wombat” is the weekly contains important information about events that will take place in the coming weeks. The newsletter is distributed to nipper parents via the primary email address associated with your nippers membership. If you have a nipper and are not receiving this newsletter, please send an email to [email protected], to confirm we have your correct contact details. Email / SMS is used for important or last-minute communications, for example a change of venue for Nippers due to challenging weather conditions. Email / SMS are sent to nipper parents via the primary email address and primary mobile phone number associated with your nippers membership. If you have a nipper and are not receiving email / SMS alerts, please send an email to [email protected] to confirm we have your correct contact details.